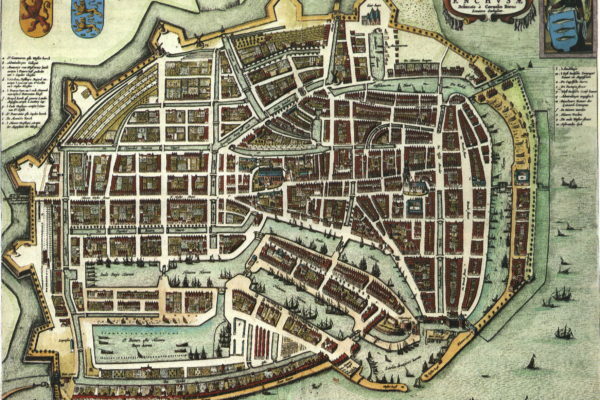 We bring the second part of Fritz van der Mark’s research into the demise of a Dutch botter. The article is primarily a reconstruction of the English period of this botter, the family who lived on board for more than 12 years and the sad fate that the ship finally had waiting for her. 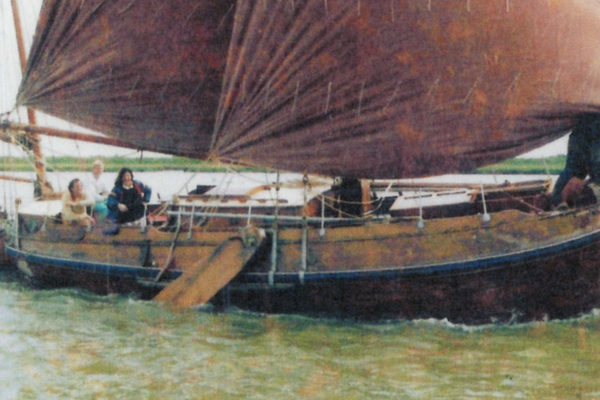 Botters in English hands: part 1 introduces us to Roy and Rosalind Elroy who purchased HK23 and sailed her to England, naming her ‘Windhaver’. In the early 1960s, Rosalind Elroy (like Mike Peyton) wrote ‘About Boats’ columns in the Guardian. 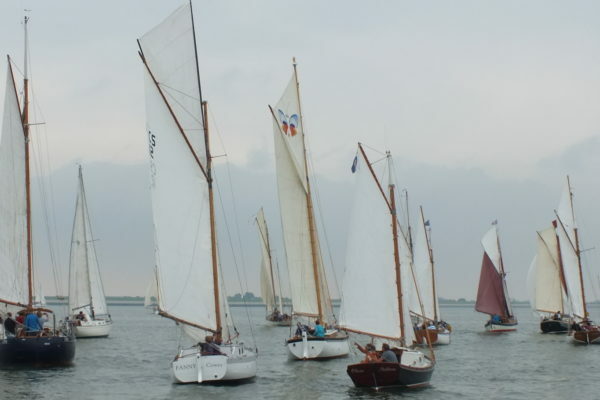 These formed the basis for the book ‘Botter Living: Life on a Dutch sailing botter ‘, published in 1966. 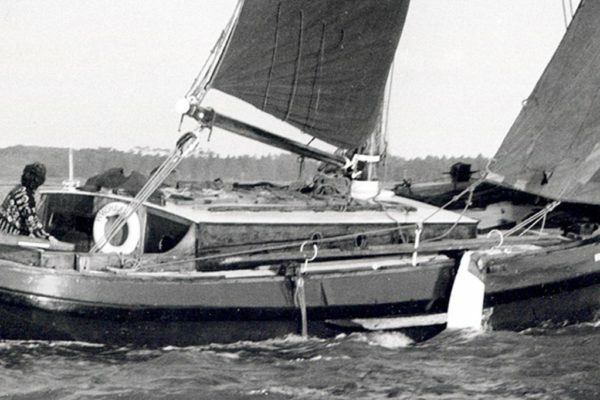 It tells the story of the search for a botter, the crossing and conversion of fisherman to cabin cutter and sailing houseboat. 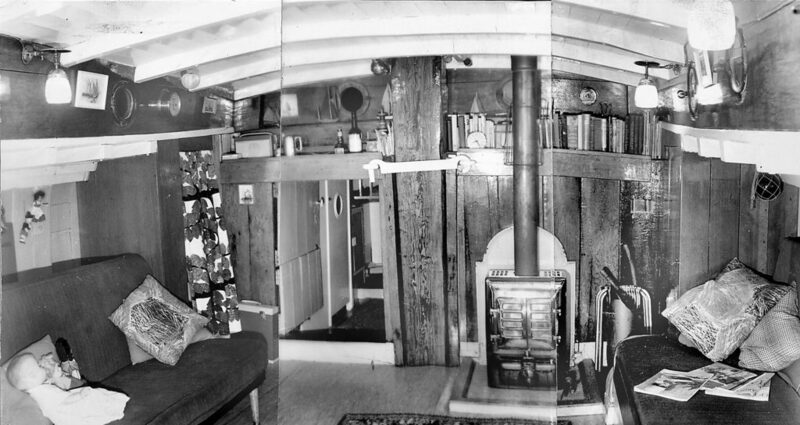 After a year and a half living on board, the cabin is ready in November 1960. Rosalind writes: ‘The cabin starts to look like a home, although it still seems large and bare after the cosy little fore cabin’. The coal stove is lit and does not go out until the next spring. The first five years of life on board, the sailing trips on weekends and holidays, will be discussed. The facilities on board are simple. The cabin was heated with a coal stove, cooking and lighting were on gas. There was a small water tank that could be filled from the shore with the aid of a hose. Only the sink of the kitchen block had a hole through the hull. In the front was a toilet area with a camping toilet. 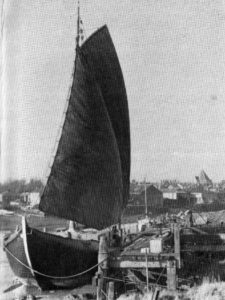 Two weeks after arrival the botter is dried at a wharf in Maldon. It turns out to be difficult to find a good berth. Eventually an old quay just above Wivenhoe was found, during the Second World War artificial harbours to be used for the landings in Normandy were built there. In July the fore cabin was ready and they are ready to live on board. They explore a part of East Coast Rivers that summer, under sail, and in the autumn the fish well was demolished and the construction of the cabin was started. A cold winter follows, an old oil stove is unable to provide enough heat and cannot burn at night. At the beginning of May their first child Caroline is born. During the following summer there was no sailing, the cabin had to be finished first. That was achieved in the beginning of November. The exterior of the botter had to be tackled next season. 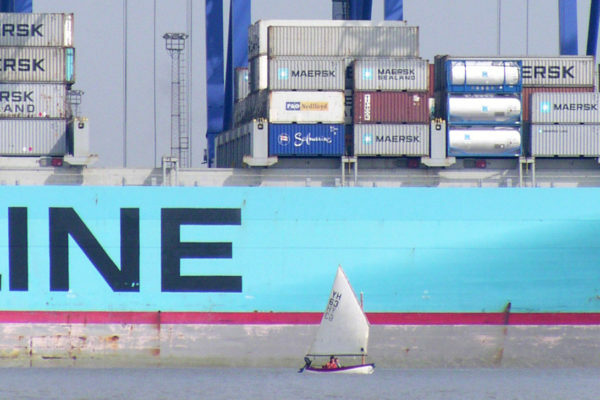 As often happens with traditional ships abroad, the ‘classic standard’ is relaxed. The hull is painted dark green, the leeboards white on the outside and bright yellow on the inside, all the ironwork becomes silvery. Spars, tiller and timber are varnished. A new pennant is ordered from Harderwijk. Because of persistent leakage Roy decides to treat the deck with a special kit and to double it with thumb-thick boards. Two years after the first baby, the second one announces itself. The midwife comes to visit and agrees to a delivery on board. She said that she had experienced in much worse conditions in shelters during the war. Roderic was born at the highest of the flood. Rosalind writes: ’The midwife wrapped the baby in an old army blanket instead of the shawl waiting by the fire. She was in her element and probably expected the all clear signal to sound at any moment ‘. ‘Windhaver’: what’s in a name? 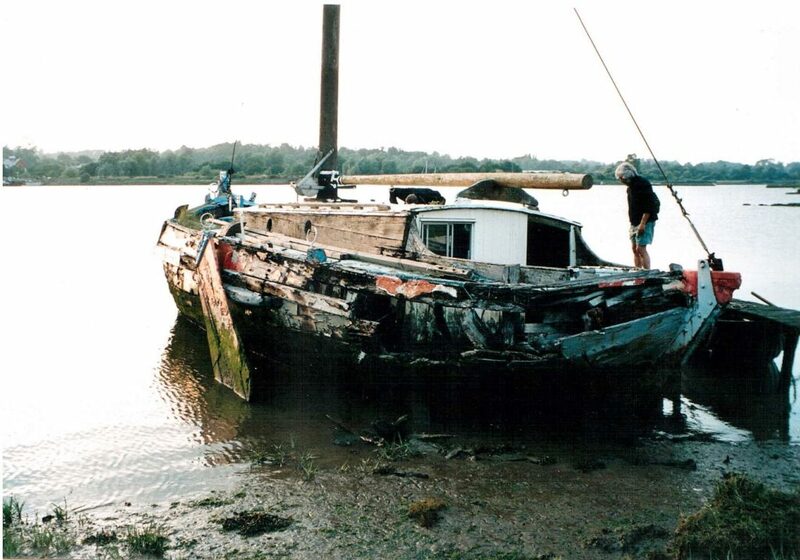 ‘Windhaver’ had a berth at Woodbridge Quay in the River Deben for the last two years. 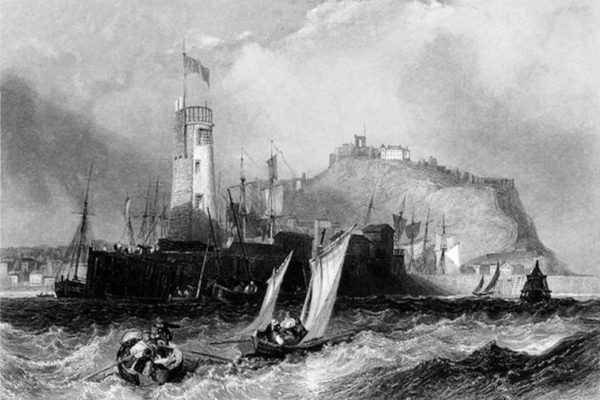 In 1972 the family moved to Newcastle, having lived on board for 13 years. Through a real estate agency the ship was sold in 1973 to a certain Granville. Using the Internet, it turned out to be possible to trace Roy Elwood, at 93 years old and still full of lively memories of his botter. Many data and photos could be added to the ‘Windhaver’ story. It turns out that Roy became familiar with sailing from an early age. 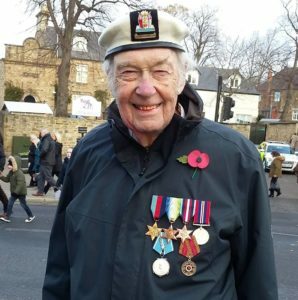 He says that during the last part of the war he sailed on a destroyer, who escorted convoys to Russia. In the ’50s he regularly rented a yacht on the south coast with friends and sailed along the coast, to the Channel Islands or Brittany. 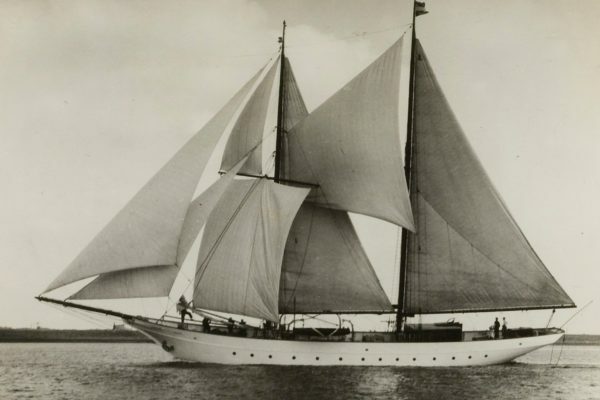 As a young couple they lived in the countryside and moved to the east coast because there was more space and there would be more classic gaff rigged vessels suitable for living. They did not find the suitable ship there, but they never regretted it. 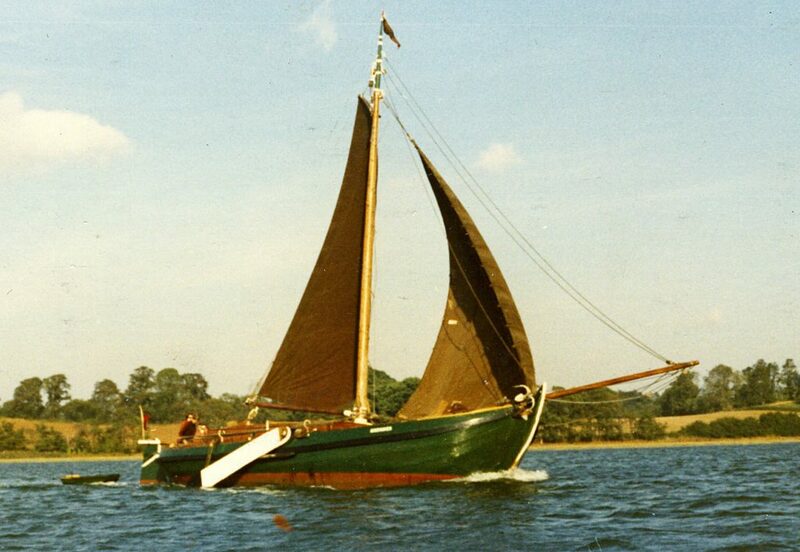 Granville was not long the owner, in 1975 the painter Paul Bruce took over ‘Windhaver’. To visit the East Coast Rivers, Peter Dorleijn made the crossing with his botter MK63 twice. 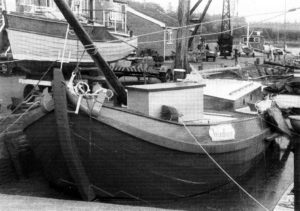 The first time was in 1986, when he saw the ‘Windhaver’ in ‘reasonable condition’ at Woodbridge Quay when Paul Bruce was her owner. Back in the Netherlands, the hob finally got a place aboard another botter. Over the years, the further deterioration of the botter on satellite images can be followed. After last winter there was not much left. 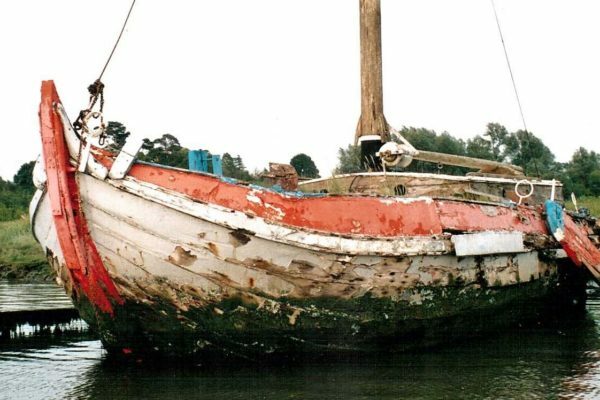 In May 2018, the news came from Woodbridge that at low tide, only the mast, falling backwards on the remains of the wreck, is clearly visible.